American safety regulators have certified an amended version of the Advanced Boiling Water Reactor (ABWR), opening the door for its construction at the South Texas Project (STP) and other US sites. The ABWR was originally co-developed by GE and Toshiba and then constructed in Japan by those two in cooperation with Hitachi. 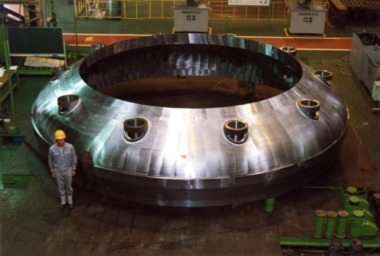 That design was granted design certification by the Nuclear Regulatory Commission (NRC) in 1997 and includes certain proprietary engineering belonging to the merged nuclear business of GE-Hitachi. Toshiba subsequently developed its own variant on the certified ABWR design for constuction at units 3 and 4 of the existing STP site. This design was submitted to the NRC in June 2009, and had to meet new aircraft impact rules which the regulator had codified in March of that year. Yesterday’s certification means that the Toshiba version of the ABWR would be considered safe even if one were to be hit by a large civilian aircraft. Following such an impact, only minimal operator input should prove necessary in order to keep the reactor core cooled, and to maintain integrity and cooling at the used fuel pools. Plans to build two of these variant ABWRs at the existing STP site date back some time, with STP Nuclear Operating Company (STPNOC) and then partners NRG applying for a construction and operating license in 2007 and the next year choosing Toshiba as technology partners and lead contractor. These were slated to be the first ABWRs constructed in the USA. Blaming the accident at Fukushima Daiichi for uncertainties in nuclear new build in the USA, NRG pulled out of the project in April this year, casting serious doubt on the project’s future. However both the COL application and the design certification process have remained active. The just-announced reactor certification will become effective 30 days after its publication in the Federal Register.